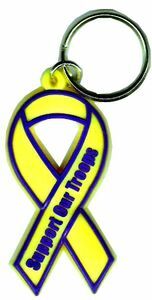 Our Yellow Support Our Troops Key Tag is shaped like a ribbon. It is outlined in blue and says "Support Our Troops" printed in blue. It is made of a soft PVC material. Measures 2 1/2 X 1 1/8 inches. Make sure to check out all our Patriotic Products!